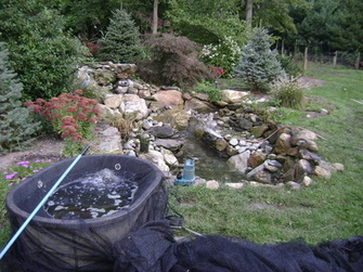 Pond Myth #16: It's necessary to drain and clean your pond regularly. The reality is, if you fail to set your system up using our Ecosystem Pond recipe so that it's working in harmony with Mother Nature, then you'll be asking for a lot of related problems that may require you to drain and clean your pond out on a regular basis. On the other hand, if you decide to work in harmony with Mother Nature instead of doing battle with her, then draining and cleaning your pond should take place only once a year (twice at most). Clean-outs should occur in the spring, before the weather gets warm and the bacteria has an opportunity to set up. Ponds with heavy fish and plant loads might need a drain and cleaning before winter sets in.